Ikôn is the most sophisticated mobile workforce automation device on the planet. Pick it up and you notice a few things right away. It just feels right. The way it rests in your hand. The balance. The feel. Next, you’ll notice the big, bright, full VGA display and the QWERTY keyboard option, color-coded for usability. Breakthrough antenna technology means you stay connected even at the edge of the coverage zone; and the longest battery life in the market so you stay supported all shift long… and beyond. Ikôn integrates data capture, voice and data communications in one compact device. Wireless capability includes WiFi, cellular 3G HSDPA and Bluetooth® connectivity. And GPS harnesses the power of location-based apps. Mobile workers drop things. It’s unavoidable. So Ikôn withstands drops from 5 feet (1.5 metres) to polished concrete. And since mobile environments are unpredictable, Ikôn has an IP65 rating, for protection against dust and water sprayed from all directions. 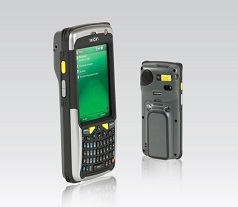 The highest battery capacity on the market ensures a full-day of productivity for mobile workers. The 3.7-inch full VGA display makes it incredibly easy to read even complex graphics and CAD drawings in low-light situations.